A strange animal mystery captivated the internet back in 2015: 200,000 critically endangered saiga antelopes in Kazakhstan died from internal bleeding after infections. Surreal photographs showed hundreds of dead antelopes that appeared to have simply dropped dead where they stood as a herd. Some researchers now have an update on that story. Following the die off, folks quickly guessed that infections from normally harmless Pasteurella multocida caused the die-off. Deeper analysis has found another connection: the infection was strongly linked to warmer weather and higher humidity. That’s bad news, considering the whole climate change thing. “The fact that P. multocida infection in saigas... appears strongly linked to high humidity and temperature is of concern going forward, given that a climate change–induced increase in temperature is projected for the region over the short to medium term” the international team of authors write in the study published in Science Advances. 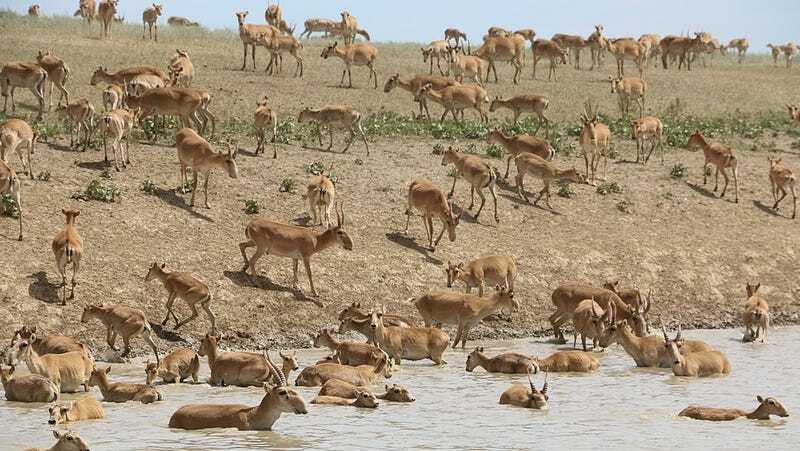 Virtually no saigas in the afflicted group survived, and the die-off killed almost two-thirds of the entire global saiga population, according to the paper. The researchers couldn’t design an experiment, and instead just began taking data, observing the dying animals and performing necropsies afterwards. The diagnosis was a disease called Hemorrhagic septicemia, caused by the usually benign Pasteurella multocida. But the quick, simultaneous onset of the symptoms in the whole group implied some environmental change occurred—like warm weather and high humidity. There are a lot more questions to answer, though. The evidence linking environmental conditions to saiga death is concerning, but the researchers don’t actually know how the changes could cause the bacteria to become more deadly, yet. And saigas are no strangers to mass die-offs. “These populations are highly vulnerable to the introduction of new diseases and the stress that goes along with that and factors that can trigger it,” veterinarian Amanda Fine from the Wildlife Conservation Society told the Washington Post. Normally, the saiga population bounces back from mass die-offs, but, “high levels of poaching since the 1990s have depleted populations, holding out the possibility that a [mass mortality event] could reduce numbers below the level at which recovery is possible,” the authors write. Are Spacecraft Killing Thousands of Antelopes In Kazakhstan?